Homer: But the car’s okay? On September 1, 1422, Henry V went one last time into the immaculate breach, only to be succeeded as King of England (and disputed King of France) by his nine month old son and only child, Henry VI. As the infant king’s mother was Catherine of Valois, daughter of King Charles VI (the other King of France, and often referred to as “Charles the Mad” due to his frequent lapses into raving insanity), the English were a bit suspicious of her motives. Since the crib and carpet set are not known for their political savvy or military genius and Mom was directly related to the current enemy, the English nobles opted for a regency council to rule in Henry’s name until he reached the age of sixteen. His uncle John, Duke of Bedford took over as regent-in-chief, but had to carry on the ongoing 100 Years War in France, leaving his other uncle Humphrey, Duke of Gloucester as Protector and Defender of the Realm, and although the position ostensibly had relatively limited powers, since one of them was the rather liberally interpreted “keeping the peace”, Uncle Humphrey wound up being the man in charge of making sure merry old England remained merry. Uncle John died in 1435, when King Henry VI was yet 13 (he would not marry Margaret of Anjou until 1445), and certainly did not have an heir, which would mean that if Henry VI were to meet with an unfortunate accident, then Humphrey of Lancaster, 1st Duke of Gloucester would become the King of England. Humphrey may have been ambitious (he tried to take over as senior regent when John died, but was thwarted by the regency council), but it’s not clear whether he actually entertained this idea. Enter Eleanor Cobham, daughter of Reginald Cobham, 3rd Baron Sterborough and mistress to Humphrey (who divorced his first wife to eventually marry her, although he had the good grace to wait until wife number one was pushing up daisies) along with her sorcerous conspirators Roger Bolingbroke, Thomas Southwell, John Home, and Margery Jourdemayne (the infamous “Witch of Eye), all of whom were implicated in a plot to kill King Henry VI through necromancy. Some detractors said this magical cabal only prophesized the death of King Henry, while still others maintained that that they treasonously attempted to engineer the death of the King through dark magic. The subsequent trial for treason, exile of Cobham, and gruesome executions of Bolingbroke and Jourdemayne proving the point that it is extremely unhealthy to predict the death of a King, at least when that death is not imminently on the horizon, and particularly if the King finds out about it. Kings tend to overreact if anyone suggests that the heavens are not on their side. Married as she was to the Duke of Gloucester, Eleanor Cobham, having risen from the middling position of Lady-in-Waiting to the Duke’s first wife Jacqueline d’Hainault to Duchess of Gloucester, was within spitting distance of becoming Queen of England should young Henry VI meet an untimely demise, thus was keenly interested in the probability of his death. In 15th Century England, if you had cash to burn and wanted to divine the odds, you consulted astrologers. Luckily, she had a few handy. Her personal clerk was a certain Oxford priest, astrologer, and reputed wizard Roger Bolingbroke and her personal chaplain was John Home. Bolingbroke was good buddies with the Canon of St. Stephen’s Chapel at Westminster and astrologer, Thomas Southwell. And to this comfy little conspiratorial coven was added Margery Jourdemayne, who had already been imprisoned once for witchcraft in 1432, and made her living concocting love and fertility potions for the well-to-do. The Duke and Duchess were childless, and some scholars have suggested this is how Cobham was acquainted with Ms. Jourdemayne. Keenly interested in the future of King Henry VI, Cobham commissioned her astrologically-inclined pals to draw up a horoscope for the young monarch, and one of the perks of being a Duchess is that people tend to oblige you. No doubt much to Eleanor’s delight, Roger Bolingbroke and Thomas Southwell, upon consulting the stars, assured her that Henry VI would contract a likely fatal illness in the summer of 1444. King Henry was a tad concerned when he caught wind of these prognostications and commissioned his own horoscope. The King’s astrologers obviously knew which side their bread was buttered on, and found no astrological evidence of the predicted sickness. Let’s face it. Predicting someone’s death, particularly a king, with disputable evidence, especially when said expiration would result in you and your husband ascending to the throne, is generally regarded as suspicious. A properly paranoid king realizes that it’s one small step from predicting his death to hoping for it, and consequently endeavoring to engineer it. Southwell, Bolingbroke and John Home were interrogated. Eleanor Cobham, Roger Bolingbroke, and Thomas Southwell were then arrested and charged with treasonous necromancy (presumably related to attempted regicide through magical means). Clearly, John Home was the rat, and it didn’t bode well that Eleanor Cobham was rather unpopular to begin with. Later historians were less than charitable. This woman had probably yielded to the delusions, which artful persons, who saw into the weakness of her character, sought to practice upon her. She was the second wife of Humphrey, and he was suspected to have indulged in undue familiarity with her, before he was a widower. His present duchess was reported to have had recourse to witchcraft in the first instance, by way of securing his wayward inclinations. The duke of Bedford had died in 1435; and Humphrey now, in addition to the actual exercise of the powers of sovereignty, was next heir to the crown in case of the king’s decease. This weak and licentious woman, being now duchess of Gloucester, and wife to the lord protector, directed her ambition to the higher title and prerogatives of a queen, and by way of feeding her evil passions, called to her counsels Margery Jourdain, commonly called the witch of Eye, Roger Bolingbroke, an astrologer and supposed magician, Thomas Southwell, canon of St. Stephen’s, and one John Hume, or Hun, a priest. These persons frequently met the duchess in secret cabal. They were accused of calling up spirits from the infernal world; and they made an image of wax, which they slowly consumed before a fire, expecting that, as the image gradually wasted away, so the constitution and life of the poor king would decay and finally perish (Godwin, 1834, p295). William Shakespeare’s play Henry VI further suggested that William de la Pole, Duke of Suffolk (who would become the principle power behind the throne if Duke Humphrey was discredited), actually set up the whole conspiracy in order to oust his rival. 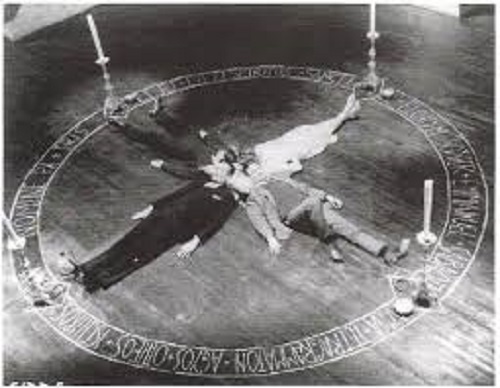 Setting up a fake séance through his double agents Margery Jourdemayne (Margaret Jourdain) and Roger Bolingbroke to entice Eleanor into treason through predictions of the death of Henry VI, he is shocked when they actually manage to conjure up some real spirits to consult. “Accordingly he arranges with Margaret Jourdain, the cunning witch, and Roger Bolingbroke, the conjuror, for a faked apparition. All is prepared for the delusion, and the spirit is conjured to appear. To the horror of Bolingbroke and the Witch a real spirit arises, and answers the questions to the extreme satisfaction of the Duchess, but to the confusion of those in the pay of the Duke of Suffolk, of whom it prophesies—By water shall he die and take his end” (Gibson, 1908, p125). Such was the general nastiness of this English version of the game of thrones, that this idea is not so far-fetched. This also hints somewhat disturbingly that it is a very fine line between intentional and accidental necromancy. Necromancy traditionally has been the summoning of spirits of the deceased for nefarious purposes, often divination, but sometimes for more diabolical purposes, such as surreptitious murder or assassination of relatively inaccessible targets. The “I slipped on a banana peel and raised the dead” defense rarely carries much weight in these circumstances as (1) you would have to know your necromancy pretty well either way, and (2) you would likely have had to assembled all the appropriate tools, prepared your rituals, and made it darned hard not to raise the dead, lacking only direct intent, to ever mistakenly raise the dead. I’m not buying it either. At any rate, John Home was questioned and immediately pointed the finger at Bolingbroke and Southwell, who bore the brunt of the charges, as noted in an early 18th Century biography of Duke Humphrey. Roger Bolingbroke, a great Astronomer, with Thomas Southwell, a Canon of St. Stephen’s Chapel, being apprehended as Conspirators against the Life of the King: The Charge exhibited against them, was, ‘For that the said Roger had laboured to consume the King’s Person, by the Power of his Necromantic Art; and that Southwell had said Masses over some peculiar Instruments by which the Astronomer practiced this Art. The News of this their Apprehension coming to the Ear of the Duchess of Gloucester, she fled for Sanctuary to Westminster. Upon this being suspected to be a Complotter in the Traitorous Design, charged upon the said Canon and Astronomer, he was cited to appear before the Arch-Bishop of Canterbury, the Cardinals of York and Winchester, and the Bishop of Salisbury; there to answer to an Accusation of Treason, Heresy and Witchcraft, in having prevailed upon the said Persons to devise an Image of Wax, representing the King’s Persons, which by the Power of their Art should consume by Degrees; intending thereby that the King himself would waste in like manner, and so procure his Death, to the Intent that she might by such Means advance her Husband to the Imperial Dignity of these Realms (Memoirs of Humphrey, 1723, p22). Bolingbroke and Southwell, both educated clergymen, were still not nobility and also had a reputation for dabbling in the black arts. Margery Jourdemayne was the daughter of a yeoman, not to mention a convicted witch released on her own recognizance. In a word, they were screwed. Bolingbrok was drawn and quartered. Southwell died shortly after being imprisoned. Jourdemayne was burned at the stake. As he had likely turned informant, John Home was accorded a royal pardon. Only Eleanor Cobham managed to escape certain death as executing a member of the nobility, particularly of the then ruling dynasty of the House of Lancaster was considered bad form. She managed to get exiled. The Duchess of Gloucester, on being brought to trial (in St. Stephen’s Chapel, before the Archbishop of Canterbury) and found guilty of the design to destroy the king and his ministers by the agency of witchcraft, was sentenced to do public penance in three places within the city of London, and to suffer perpetual imprisonment. Her confederates were condemned to death and executed, Margaret Jourdain being burnt to death in Smithfield. The duchess, after enduring the ignominy of her public penance, rendered peculiarly severe by the exalted state from which she had fallen, was banished to the Isle of Man, where she was placed under the ward of Sir Thomas Stanley. On the way to her place of exile, she was confined for some time, first in Leeds Castle, and afterwards in the Castle of Liverpool; the earliest and the noblest witch on record within the county of Lancaster (Harland, 1882, p174-175). Dalliances with the dead are generally inadvisable, and anything they tell you should be taken with a grain of salt. They really have nothing to lose, an eternity of boredom, and a rather sullen and inactive cohort for amusement, so it stands to reason that they might spread nasty rumors among the living for giggles. Now, necromancy is a rather misanthropic activity to begin with, since the necromancer has essentially thrown up his hands and admitted to preferring the company of the dead to the living, but you have to go with whatever floats your sacrificial goat, and if we learn nothing else from the sad fates of Cobham, Bolingbroke, Southwell, and Jourdemayne, recognize that should you wish to avoid imprisonment, torture, execution, or in the best case scenario, exile to the Isle of Man, do make sure a slightly unstable King doesn’t find out about it. Mostly, just stay away from kings on principle. Then again, these days technology has outpaced necromancy. We can do away with all the messy rituals and incantations, the dangerous dark arts, and dubious thamaturgical practices of the days of yore. If we really want to talk to the dead, we can just bury people with cell phones. Gibson, John Paul Stewart Riddell. Shakespeare’s Use of the Supernatural: Being the Cambridge University Harness Prize Essay, 1907. Cambridge: Deighton, Bell & co., 1908. Godwin, William, 1756-1836. Lives of the Necromancers: Or, An Account of the Most Eminent Persons In Successive Ages, Who Have Claimed for Themselves, Or to Whom Has Been Imputed by Others, the Exercise of Magical Power. London: F. J. Mason, 1834. Harland, John, 1806-1868. Lancashire Folk-lore: Illustrative of the Superstitious Beliefs & Practices, Local Customs & Usages of the People of the County Palatine. London [etc. ]: J. Heywood, 1882. Memoirs of Humphrey, Duke of Gloucester; (As They Relate to the Story of Mr. Phillips’s Tragedy of That Name; And Proper to Be Bound Up With It): In Which the Several Characters, Represented In That Drama, Are Fully And Faithfully Draw : With an Account How Far They Were Instrumental In the Ruin And Murther of That Great Good Man. London: Printed for Thomas Cobbett … and sold by T. Payne, 1723.